As many organisations are heading for heavy waters, we should not forget the question of moral leadership. Never forget your values, David Ducheyne argues in a plea for a human approach of difficult decisions. Every leader has to do stuff they’d rather not. Leadership is not a cherry-picking activity. Leaders assume their role for better and for worse. And I believe that we are in rough waters and that leaders increasingly will be there for the worse. As industries get disrupted, political tensions rise, and organizations are confronted with legacies from the past, they will have to reshape what they do and how they do it. And that means that as companies are changing the very fabric of their operations, they will want to hire people with new skills and fire people that do not have the appropriate skills or potential. It means that the lives of many will be disrupted as well. The question is not if this is going to happen and why, but more when it will happen and how leaders can cope with that. Organizations have espoused values. These are about respect, trust, customers. These values define – or are intended to define – the culture of an organization. Values are intangible but important as they serve as guidelines in both strategic and operational matters. There is no reason why they stop to be guiding when an organization needs to take difficult decisions. Take General Motors. Their vision is that (they) have the ambition, the talent and the technology to create a world with zero crashes, zero emissions and zero congestion. This vision is new and is not in line with its legacy. To realize that vision, the company needs to change. It’s not that an executive likes to take such a decision. Unions might complain about the heartlessness of these decisions and for all individual worker who find themselves without a job, this is a tough pill to swallow. Nevertheless it has happened. And we know what it does to trust, loyalty and engagement. And that’s why an organization should never forget about its values in difficult times. Values are even more important in dire moments. -So how can one rhyme value like trust and respect, with massive lay-offs? There are actually only two questions an executive has to ask. Do we have a good or even the best reason to do this? This also means that all alternatives cannot topple the decision. It also means that the decision is the best when all interests of all stakeholders are put in the scale. Can we do it the right way? Should we do it in a sniper-like attack, catching the people cold? Can we do it as empathically as possible? How can we do this with respect for the valuses we have defended in the past? These are tough questions to ask and to answer. But they have to be asked whenever an organization has to go through with a difficult operation. But how it conducts its business tells us something about the identity and values of the organisatuon. Both are important for trust. But it’s the latter that has the biggest impact on trustworthiness. If an organization does not answer the question of the how appropriately, it will damage its relationship with those who are touched by the decision, and their peers. Someone might say there is no way to do a redundancy program elegantly. I tend to disagree. The decision to go for layoffs is just a moment in time. What is interesting is the actions before and after that moment. There are many questions to be asked about those two periods. Has the company invested in the development of the employability of its workers? Has the company been transparant about the risks the organization faces and about the changes in the industry? Has it been available to debate with representatives about the options for the future? Has the leadership built up a trust account by handling business issues fairly? Does the organization invest in reconversion programs to help workers find a new role within or outside of the organization? Does leadership engage in direct debate with people? Is there a commitment to minimize layoffs when possible? Is the company acting fairly when pursuing the layoffs? At least leaders should try and move the bar. The fact that the two questions are asked, is a sign that there is a moral debate going on. And whilst it is clear that such a program will never be able to be satisfactory for everyone at all times, having the debate and doing things that genuinely show the moral responsibility leaders have, is better than treating it as just another layoff wave. General Motors offers its staff alternatives. There’s a buy-off program that employees can use voluntarily. Even though these are still exits, they are voluntarily. Offering a choice is always better than offering no choice. Moreover, workers that are affected can move to other plants. Even when that might be difficult for many, it’s a choice again. The automotive industry is in full transition. The move from fossil fuels to electric city is a major one. But even more disruptive is the move towards self-driving cars, car sharing and hybrid mobility. Doing nothing would be detrimental to the future of the company. It would threaten the employment of more than 165,000 workers. So it’s clear that GM has a good reason to change. And it seems it’s trying to find the right way, taking into consideration the impact on its workforce. Taking responsibility will inspire trust. Dealing with human beings in difficult times, requires high standards of moral behaviour. It asks of leaders to be humbly available, empathic, fair, kind and it requires them to engage in reciprocal behaviour. As I believe we have rough times ahead, we might see more frictional things happening. And we should do them in a sustainable – i.e. moral way. Organizations that have solid values will be able to conduct these operations whilst maintaining trust. But organizations that have weak values, will lose the credibility they need to attract and retain talented people in the future. Leadership is one of the three levers for strategy execution. This blog is about the moral side of leadership. 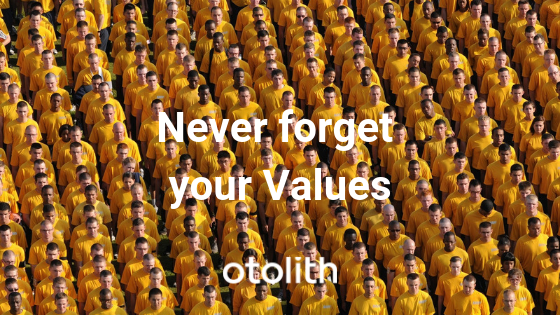 Get in touch with Otolith if you want to develop the leadership quality in your organization.